hockey « Japan, Hockey, Baseball, etc. 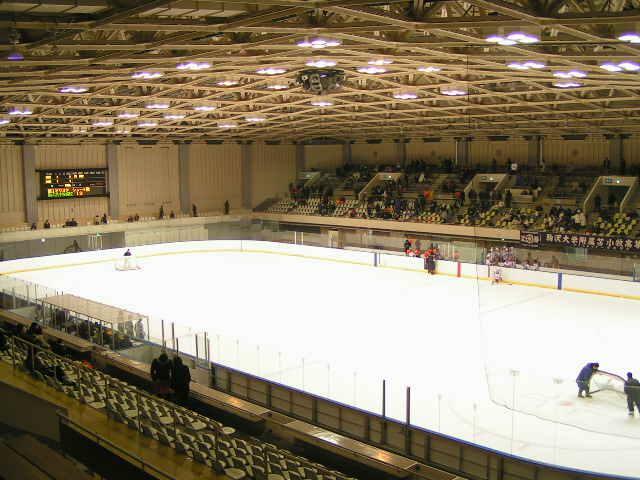 Some information about the Tsukisamu Arena in Sapporo, Japan where the 2008 IIHF World Championship Division I Group B games will be held. Chances are your mobile phone won’t work in Japan because Japan uses a proprietory cell system. Even overseas 3G phones won’t work just by inserting Japanese SIM cards (though things may have changed recently, so check with your local carrier). Very inconvenient for visitors, I know. 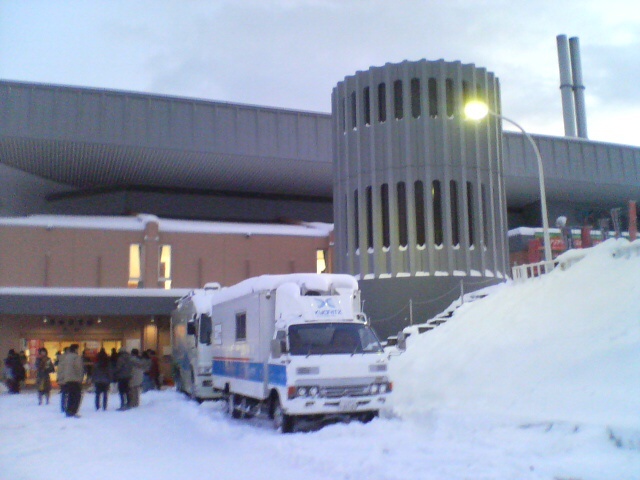 Tsukisamu Arena has a capacity of about 3000 (this year’s AL games drew close to 2900). I recommend staying in the Susukino area of Sapporo, as that’s where the nightlife is, and it’s only 4 metro stops away from the Tsukisamu-Chuo station where the arena is situated (a 3 minute walk) on the Toho metro line. All weekday Japan games are scheduled at 8pm, so I expect a good crowd for those games (not sure about preordering tickets). But I don’t expect much of a crowd for the other games, as Sapporo’s not a hockey town (there are some nice mountains nearby, so skiing and snowboarding are more popular) and Japanese people tend not to take many holidays. If I have the time I’ll try to do a Team Japan preview once the roster’s announced. It’s amazing that this all East European (except for Japan) tournament is being held in Japan at all. I wonder what went down in the host city nomination and the subsequent voting process. The tournament will run from 13-19 April at Tsukisamu Arena in Sapporo, Hokkaido, Japan and the other participating teams are Croatia, Estonia, Hungary, Lithuania, and Hungary. This is Japan’s best chance to win the dvision and qualify for the top group, playing in front of the home crowd, and having ECHL regulars G Fukufuji (unimpressive .891 save percentage this season, but he’s on one of the worst teams in the league so all goalies at Bakersfield are sporting a sub-.900 mark after posting better numbers in previous seasons) and F Nishiwaki (14+16=30 pts in 54 games so far, but was one of the leading goal scorers in the AL the two previous seasons) on the national team with their ECHL clubs slated to miss the playoffs. ECHL season runs to the first week of April, so these two will be able to join the national team for this Div I tournament at home that’ll run from 13-19 April. Oji goalie Haruna has been having a fantastic AL playoffs, posting 1.88 GAA and .924 save % so far in 8 games, and he’s had some success in international tournies if my memory’s correct. And Seibu’s Kikuchi, who is always solid in Asia, is also available, so Japan should be solid in goal, hopefully the porous defense from last year’s tournament has somehow been improved, but I don’t see how. Other interesting candidates remaining on the Japan team selection squad (down to 30 now, but there will be further cuts before the start of the tournament to get down to regulation size) are D Okubo playing for High1 of the Korean entry to the AL, he totally drove their offense this past season, and led AL defensemen in assists and points. University kids D Haga of university champs Toyo University (who scored a hat trick in the university championship finals), D Yanatori of finalist Meiji Univ., and F Kuji of Waseda University are also included in the selection camp. Other players are the usual suspects from AL teams including naturalized Canadian born veteran players (all Japanese descent Nikkeis) D Aaron Keller (Oji), F Ryan Kiyoshi Fujita (Seibu), and F Darcy Mitani (Cranes). Interestingly, the national team will play two warm up games again Amur Khavarovsk (the B team, I assume). 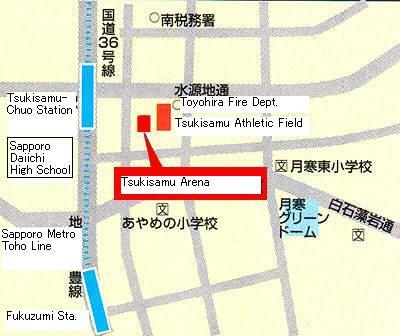 1 April at Tomakomai Hakucho Arena, and 3 April at Sapporo Tsukisamu Areana, both games start at 19:00. The 30 man selection camp squad (in Japanese). IIHF website for this tournament. A good roundup on Eurohockey.net about the KHL (Kontinental Hockey League) that will replace the Russian Super League in Russia. The league aims to expand beyond Russia, and already have a Kazakhstani club Barys Astana join the league, and there are rumours about Jokerit Helsinki of Finland as well. The league will operate with 24 teams, but only have 22 teams committed so far. It will be interesting to see who the other 2 teams will be. I’m not quite keen on the division idea that will have ever changing divisions according to team strength (like in the soccer World Cup, teams are put into a pool, and drawn out of a hat, lottery style to determine the divisions). At least locking in the divisions for 3-5 years would create some consistency since the divisions are not geographical anyways. The salary cap of approximately $24 million per team will be enough to retain and regain some (marginal) Russian talent from the NHL. The salary power balance is reminiscent of the balance between MLB and NPB. Unless the KHL really takes off and can bring salary levels up to near-NHL levels (though it’s already pretty impressive at nearly half), it won’t be a truly competitive league (like in soccer with the English, Spanish, and Italian leagues). But it’s a good start, let’s hope the league has a financially viable business model. Incorporating drafts and player exchange trades into Europe will be a really interesting sports business experiment. 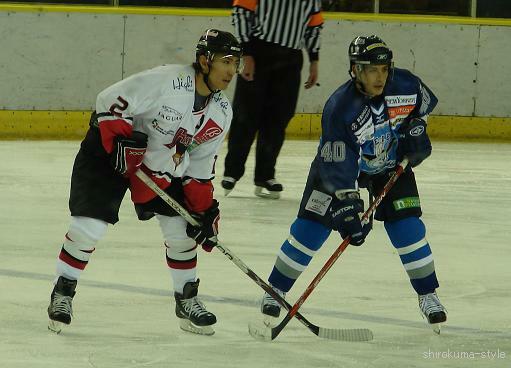 Games 3 and 4 of the 2008 Asia League Ice Hockey semifinals were played last week. Oji handily swept the 2nd place team in the regular season High1, outscoring them by an aggregate of 17-8 in the 3 games. High1 seems to have gone down without much of a fight (except for game 2), the team’s definitely got potential, so I’m hoping for a better playoff performance from them next season. Oji makes its first ever AL final (it has been Cranes – Seibu (Kokudo) every season in this league’s brief existence). For this once glorious team that won numerous Japan League and Japanese Championship titles, this could be a return to glory (though, getting to avoid Seibu and the Cranes leading up to the finals was probably the biggest blessing). Oji’s last Japan League title came in 1994, so they’ll be gunning for the trophy for sure. Cranes vs Seibu, this has been the staple of Asial League championship every season (and in Japan League championships leading upto the creation of the Asia League in 2003). Yet again, the Cranes won a playoff series on the back of their new goalie Jamie McLennan. Though the Cranes demolished Seibu 7-2 in game 3, McLennan won game 4 all by himself making 36 saves in the 2-1 win to seal the series at home while in Kushiro, Hokkaido. He has been absolutely stellar throughout the playoffs posting 93.75% save percentage in round 1 against Halla, and a 92.8% save percentage against the most explosive offense in the league in Seibu in the semifinals. Other than getting involved in some rough stuff in game 2 and taking some penalties that led to Seibu power play goals, Jamie has been just amazing. If he keeps his cool, the Cranes can take the Hokkaido derby final and defend their AL title. Oji’s best bet to dethrone the champions may be to get under McLennan’s skin. After all, a goalie fresh out of the NHL (he was a backup only last season) is well above the level of play in this league (AL is probably a similar in level to a less physical ECHL). Semifinals games 1 and 2 review. 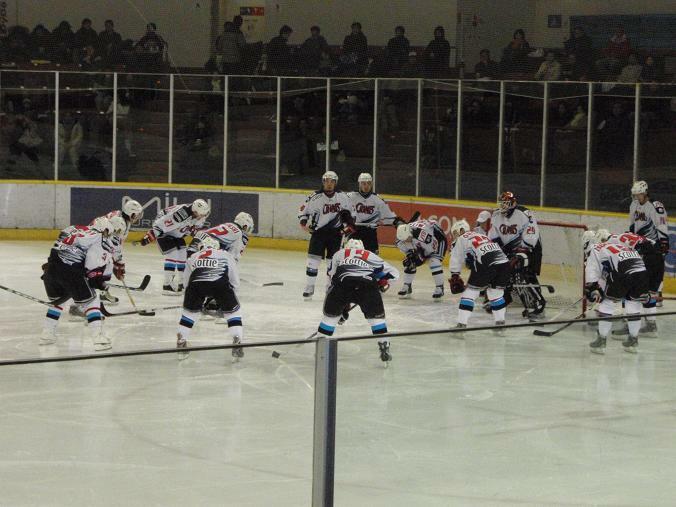 Wow, a website about North Korean ice hockey! (DPRK Hockey) Not much information there yet, but just the rink is fascinating. Here’s the usual chummy photo op from when North and South Korean teams face off against eachother in various sports. So, Seibu and the Cranes split the games in Tokyo and head up to Hokkaido with the Cranes now having earned the home advantage with games 3 and 4 taking place up in Kushiro. Oji pounded 10 goals into the High1 net despite only having 30 shots on net (33% shooting percentage!) 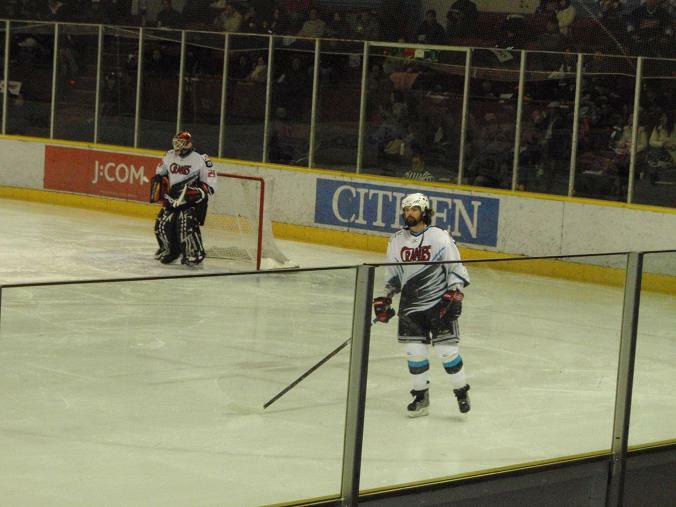 in game 1. High1 finally pulled the starting goalie Eum (who had a solid regular season with 90.9% save percentage) after 32 minutes when he let in the 6th goal. High1 came back much sharper in game 2 with the 1 goal loss, but was still outshot 36-24. Defenseman Okubo was involved in both High1 goals, but was also on the ice for all 3 even strength Oji goals, so maybe the Japan national team candidate’s offensive prowess does come with a price. Both teams with first round byes seemed to have been rusty coming off the long break in the schedule, as the league wrapped up its regular season on 27 January, and the top 2 teams didn’t see playoff action until 1 March, a month later (Seibu had the 3 Japanese championship games inbetween, but High1 was forced to play practice matches against local university teams to stay in game shape). I attended the game 1 between Seibu and the Cranes in Higashifushimi, Tokyo. Seibu had solid rushes up the ice time and again in the first 2 periods, but hardly any of them led to quality scoring chances or shots. Then, as things came together for the team in the 3rd, Jamie McLennan was there to slam the door shut with one great save after another. McLennan deservedly won the game MVP. Seibu won game 2 convincingly by 3 goals, but all 5 goals in the game were scored on the power play (and only 1 Seibu goal was with a man advantage, the other 4 goals were scored with 2 man advantages! ), so maybe this means Seibu hasn’t figured out McLennan yet, so it will be interesting to see what happens in games 3 and 4. The 2007-08 season of AL was competed with 7 teams (the league makeup changes every year, hopefully we’ll get some new teams entering the league in the near future). The top 6 teams make the playoffs (haha), the top 2 teams get a bye in the first round where 3rd plays 6th and 4th plays 5th. Another solid season by the bunnies. Like in previous years, the team started training hard early in the summer with a regimented program under the guidance of their conditioning trainer. This worked as the team started off the season 7-1-1 (Sept-Oct) and solidly in first place. But this team can get sloppy and streaky during the regular season, and only the luck of their schedule allowed Seibu to claim top of the table. The Rabbits finished the season with 3 straight games against the lowly Bucks, easy 9 points (8-0, 4-1, and 8-2 wins) to overtake High1 for 1st place. But the bunnies went only 4-6 leading up to the Bucks games at the end of the season. Seibu did beat Oji and the Cranes to capture the All Japan Championship on 10 Feb, and the bunnies are deadly clinical on the power play leading the league with incredible 34% conversion rate. Seibu is definitely the favourite in the upcoming playoffs, especially with the unstable Cranes this year, and the unknown factor of High1 in the post season. Seibu features the highest scoring Asian trained player in the league in the veteran Takahito Suzuki, as well as Prpic, Fujita, and Yule who all cracked the top 10 in scoring. Then again, they did run up the score 15-3 against the Sharks one game, so the AL scoring leader board and goal differentials figures are still not very reliable. And all these players are on the wrong side of 30, so they have the skills and experience, but a youthful team may outskate and out-grit them. 21-1-12 for 62 points last season as Kangwon Land (34 game schedule in 2006-07). On a per game basis High1 earned 1.93 pts, with a GF of 3.93 and GA of 2.97. Whereas Kangwon last season was 1.82 pts, 4.5 GF, and 3.24 GA. Upon first glance it seems like the team did better last season, but there were two Chinese minnows last year, where as they combined to form the somewhat more competitive China Sharks this year. So, it’s difficult to compare with just those raw numbers. But one aspect of the team that definitely improved was the power play unit. It went from league average 24% (5th out of 8 teams) to an impressive 31%, good enough for 2nd in the league. Not taking stupid penalties, and containing the High1 power play will be the key for the team that meets them in the semifinal (Oji or Nikko). Korean teams did have an easier schedule than the Japanese teams though, as they got to beat up on the Sharks 3 extra times when compared to their Japanese counterparts. So this may really have been a 3rd place team had the schedule not been unbalanced with the extra regional games. The incredible aspect of the High1 season was that the team lost its starting goalie Ho-Seong Son (34GP, 89 Sv%, 3.14GAA), top scorer Kyu-Hyun Kim (26+38=64pts), and young national team player Kwon-Jae Lee (1+5=6pts) all to its archrival Anyang Halla. So, High1 was reasonably expected to struggle this season. But in their place Hyun-Seung Eum (29GP, 91 Sv%, 2.81GAA) and Korean-American import Alex Kim (23+28=51pts, good enough for the league scoring title) more than filled in. Japanese defenseman Tomohito Okubo continues to be crucial to the team’s success with 28 assists (2 shy of league leader Prpic’s 30) and 33 points to lead all defensemen, and he’s the only foreign based player, besides NHL experienced goalie Yutaka Fukufuji, to be invited to the national team selection camp. Together with D Byoung-Wook Hwang (8+12=20pts) and the Smith brother (Tim 23+23=46pts, Bud 9+26=35pts) the High1 fivesome is truly a force to be reckoned with. Recycled Paper Scandal to hit Japanese Hockey? Now that my work had settled down a bit, I was going to write Asia League 2007-08 Regular Season review and Playoff preview articles. But, there may be bigger issues at stake in the world of Japanese hockey. Japanese hockey has endured through much travail in this century. Starting with Yukijirushi (dairy products manufacturer) folding its hockey team following a food poisoning scandal in 2000, Furukawa Electric dropping its hockey team which forced the team to become the first fully professional hockey team in Japan, the Nikko IceBucks. Then there was the insider trading scandal by the big boss of Seibu Group and the biggest backer of Japanese hockey, Tsutsumi Yoshiaki, this forced the two group teams Seibu and Kokudo to merge in a cost cutting measure. This reduced the number of top level Japanese club teams to 4 from 6 which in turn forced the hands of JIHF to create the Asia League (as the number of pro hockey clubs in Korea and China were on the decline as well), and this has been great for increasing the level of play in Korea, and encouraging international hockey relations and more competitive play in the top league. If this scandal hits both Nippon Paper and Oji Paper hard enough, could we possibly be seeing the demise of these teams, or a possible merger, in the hockey heartland of Japan? I hope not, as that could really signal the end of top level pro hockey in Japan and East Asia. So, I guess this is no time to be joking about how the Oji team has an eagle as a mascot and the bird even adorns its uniform, but the team has no nickname when it should obviously called the Eagles, it would make for easier and better marketing as well. Or wonder why last season’s the treble winner (AL Regular Season, Playoffs, and All Japan Championships) Nippon Paper Cranes are struggling despite the great performance of former NHLer Jamie McLennan in goal who joined the team midway through the season and promptly posted the 2nd best save percentage in the league. Incidentally, the big paper companies are most likely the cause behind the always beautifully produced Asia League program booklets.